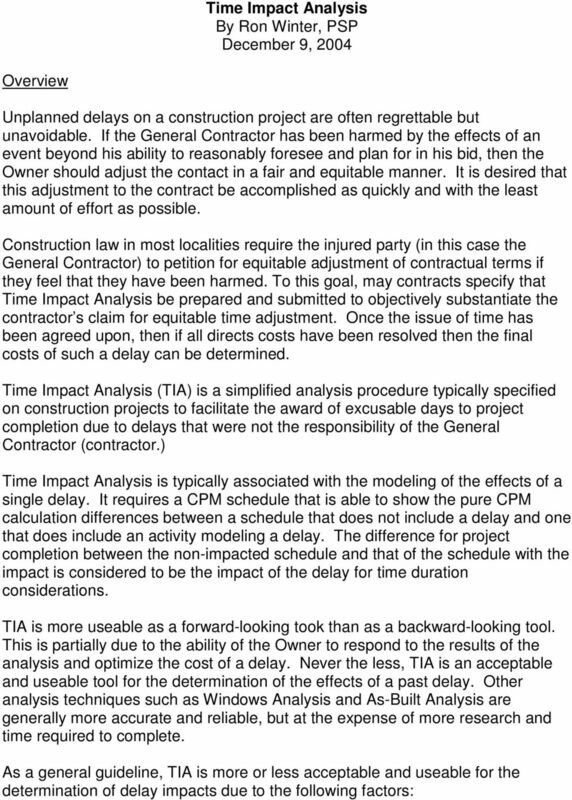 Download "Time Impact Analysis By Ron Winter, PSP December 9, 2004"
3 after the delay as long as the combined durations of the split activities equals the original duration of that activity. The Owner should review, negotiate (if necessary,) and approve the fragnet before proceeding with the further steps. It is acceptable to combine all of the following steps into one, buy the Owner still needs to approve the step considerations in order in order to approve the TIA. STEP 2: Select the appropriate accepted schedule to impact. The appropriate schedule should be the last accepted schedule update prior to the date of the delay. The baseline schedule should be used if the delay began prior to the first schedule update. 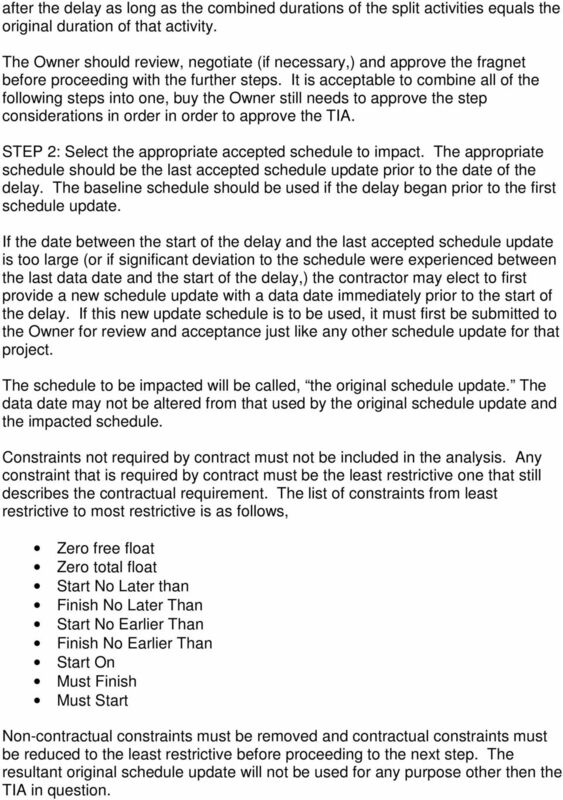 If the date between the start of the delay and the last accepted schedule update is too large (or if significant deviation to the schedule were experienced between the last data date and the start of the delay,) the contractor may elect to first provide a new schedule update with a data date immediately prior to the start of the delay. If this new update schedule is to be used, it must first be submitted to the Owner for review and acceptance just like any other schedule update for that project. The schedule to be impacted will be called, the original schedule update. The data date may not be altered from that used by the original schedule update and the impacted schedule. Constraints not required by contract must not be included in the analysis. Any constraint that is required by contract must be the least restrictive one that still describes the contractual requirement. The list of constraints from least restrictive to most restrictive is as follows, Zero free float Zero total float Start No Later than Finish No Later Than Start No Earlier Than Finish No Earlier Than Start On Must Finish Must Start Non-contractual constraints must be removed and contractual constraints must be reduced to the least restrictive before proceeding to the next step. The resultant original schedule update will not be used for any purpose other then the TIA in question. 4 STEP 3a: Insert the fragnet into a copy of the appropriate schedule. Using the approved fragnet as a template, add the impact activities and make the existing activity adjustments as necessary to mirror the fragnet. With the duration of the delay activities set to zero, all computed and actual dates in the original schedule update must match that from the schedule which it was derived from. OPTIONAL STEP 3b: If the delay time period involved is long or if substantial mitigation of the delay has occurred, then an option step may be made to consider the effects of mitigation. Typical construction law requires that the contractor mitigate the effects of any delay, if that mitigation can be made without additional cost or disruption to the project. If Step 2b is not implemented, a statement must be provided with the TIA to explain why this step was unnecessary. 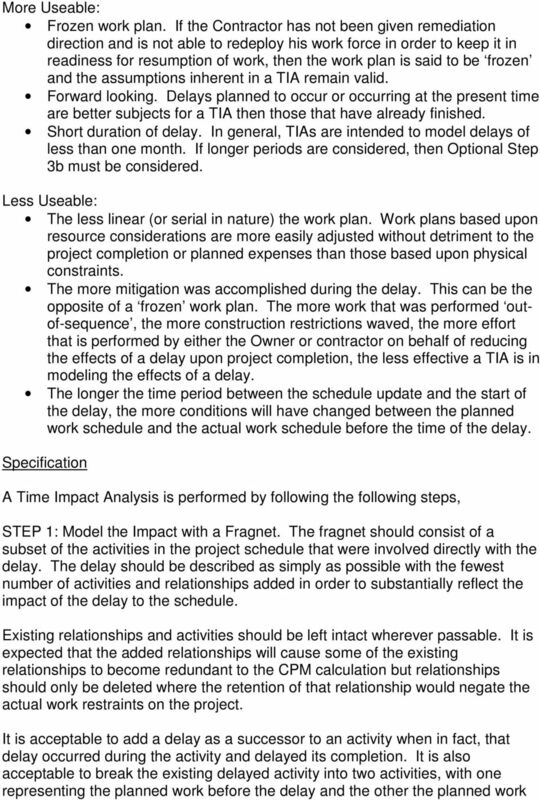 Reasons for not implementing Optional Step 3b include frozen work plan, forward-looking impact analysis, and shortness of duration of the delay. 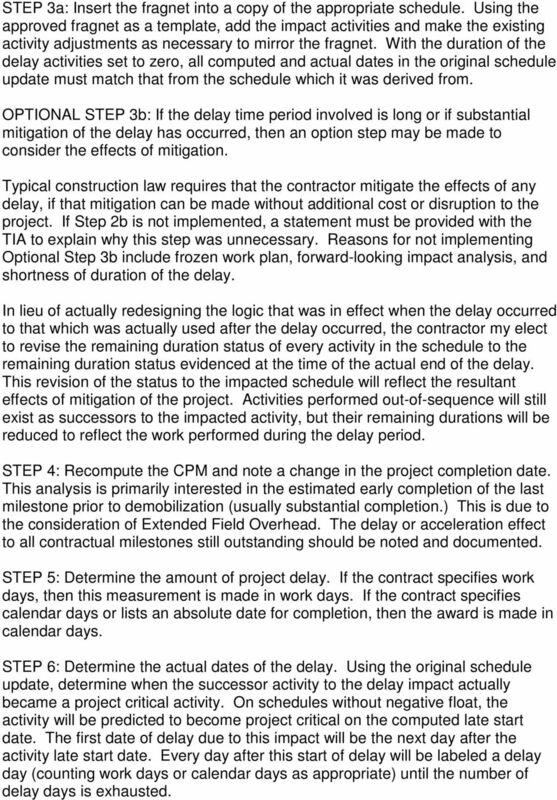 In lieu of actually redesigning the logic that was in effect when the delay occurred to that which was actually used after the delay occurred, the contractor my elect to revise the remaining duration status of every activity in the schedule to the remaining duration status evidenced at the time of the actual end of the delay. This revision of the status to the impacted schedule will reflect the resultant effects of mitigation of the project. Activities performed out-of-sequence will still exist as successors to the impacted activity, but their remaining durations will be reduced to reflect the work performed during the delay period. STEP 4: Recompute the CPM and note a change in the project completion date. This analysis is primarily interested in the estimated early completion of the last milestone prior to demobilization (usually substantial completion.) This is due to the consideration of Extended Field Overhead. The delay or acceleration effect to all contractual milestones still outstanding should be noted and documented. STEP 5: Determine the amount of project delay. If the contract specifies work days, then this measurement is made in work days. If the contract specifies calendar days or lists an absolute date for completion, then the award is made in calendar days. STEP 6: Determine the actual dates of the delay. Using the original schedule update, determine when the successor activity to the delay impact actually became a project critical activity. On schedules without negative float, the activity will be predicted to become project critical on the computed late start date. The first date of delay due to this impact will be the next day after the activity late start date. Every day after this start of delay will be labeled a delay day (counting work days or calendar days as appropriate) until the number of delay days is exhausted. 5 Every date determined to be a delay date will be excusable to contractual milestone completion, providing that this date has not already been awarded as a delay date due to a prior TIA or other excusable event such as an adverse weather date. Should the day already be designated as an excusable delay date, then this day will be considered concurrent in terms of a previous delay. No single date will be granted an additional contractual milestone excusable day if it has previously been granted one for any other reason. Excusable deal days will be granted regardless of any contributing contractor concurrent delay on that same date. The issue of compensability of extended field overhead costs is dependent upon the lack of (or contributing factor in) contractor concurrent delays on any given date. Comparison of Calculated Results with Actual Observance Time Impact Analysis is not an attempt to simulate reality. It is a recognized analysis technique designed to facilitate quick estimation of the time delay to the project caused by a single delay. It is not reasonable to require that a delay modeled in a Time Impact Analysis to manifest itself in that exact number of days that a project actually ends up being late. This is partially due to the extenuating effects of acceleration and mitigation. In addition, other delays (including the contractor s own inefficiency) may also contribute to late project completion. In practically all cases, a typical construction project will have enough deviations from the planned baseline schedule as to make the manifestation of any single delay unattributable to any particular day after the planned end of the project. Awards of time and costs from a TIA are intended to include the compensation for acceleration and disruption in response to a delay. 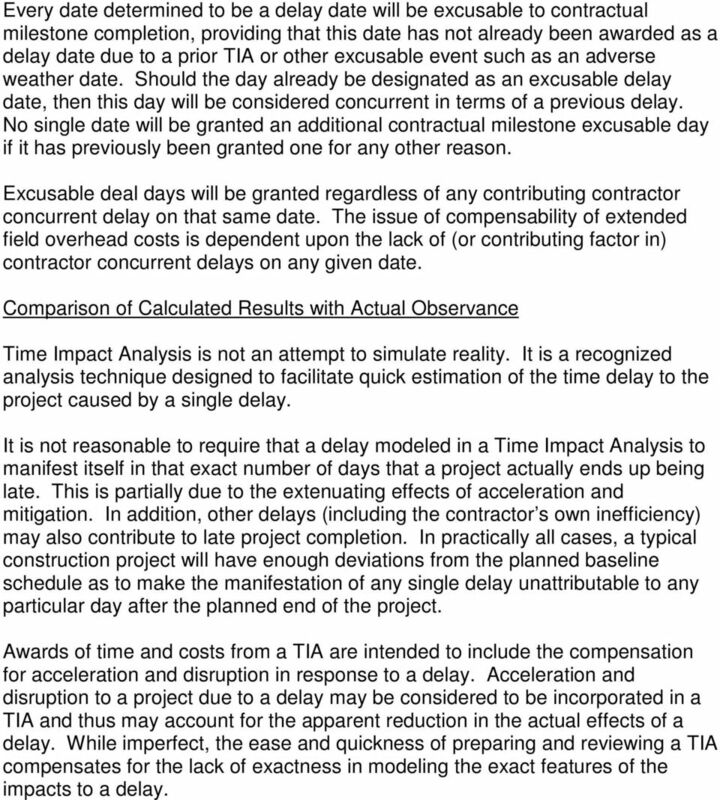 Acceleration and disruption to a project due to a delay may be considered to be incorporated in a TIA and thus may account for the apparent reduction in the actual effects of a delay. While imperfect, the ease and quickness of preparing and reviewing a TIA compensates for the lack of exactness in modeling the exact features of the impacts to a delay.